Momma Told Me: Pets are family. Every now and than I get a little bored. As bad as it sounds, it sometimes feels as though I don't have enough things to care for in my life. Maybe it's because I was an only child, or perhaps the simple fact that our 'pets,' when I was growing up, never stuck around more than a few months. I have an attachment to living things and caring for them, whether they walk on 2 feet, 4 feet, or rely on fins to get around. Sabrina (10) has a dwarf bunny and a rather precocious adult cat, and of course, here at our house, we have Truffles (the cat who lives life as a dog) and Nora (the awkward but adorable Morkie). I know it's Sabrina's job to drag home injured and wayward animals, but it's usually me pleading for a new family member at the pet store. I've been campaigning for a hammy (hamster) for months, though the upkeep and smell of small rodent pets has kept that idea at bay, and recently decided to make the plunge with a different kind of pet. Choosing the right pet for your family can seem like a dubious chore. Even within a species (dog, cat, fish, bird, etc), there are many variants to consider (size, age, temperament, upkeep). In college my home had a working saltwater tank with some rather expensive fish; but I was hardly their caretaker. 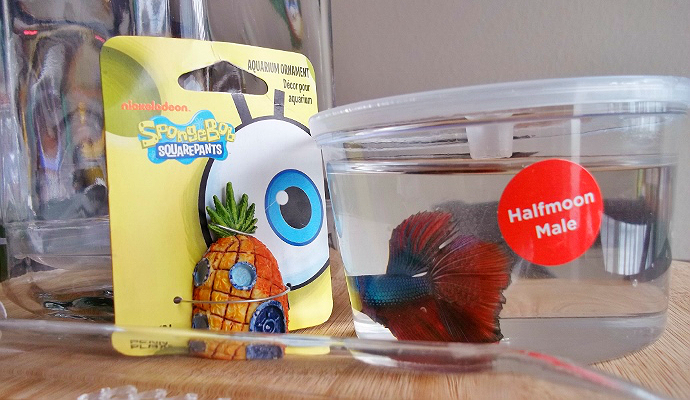 The truth is, the thought of caring for my own fish was a bit overwhelming at first. Sure they swim around in the designated area of a tank, and are relatively easy to feed, but maintaining a safe liquid habitat, and cleaning said habitat without disrupting the fish is a whole other story. Then there's the actual fish. Choose an expensive fish, and it likely will need more advanced care (larger tank, aeration, fresh foliage), choose a more affordable fish and you may be bringing Mr.Scales back in a Ziploc baggy floating backside. Furry or finned I have no desire to be responsible for the demise of an animal, and fish have always been something a little foreign to me. Recently I discovered a new Beta tank designed to be self cleaning; well, as much as a tank can be. This No Clean Aquarium operates with a gravity driven fill system that pushes dirty water at the base of the tank up through a tube and out a spout at the top, when fresh filtered water is poured in. (More on the tank itself in a future post.) This method of external (hands free) cleaning gave me the confidence to invest in a Beta, one of the least fussy varieties of finned pets. Beta fish live in freshwater surroundings and do not require aerated water (this means pump free tanks); they simply rise to the surface for air as needed. They're your traditional starter fish, but have a few particularities that require one fish per habitat. Beta fish also come in a variety of colors and fin sizes which often range in cost from $4-$20. Thankfully there was a very helpful young woman working at the pet store we frequent who was happy to answer all of our never-ending questions and set us up with the necessary supplies. 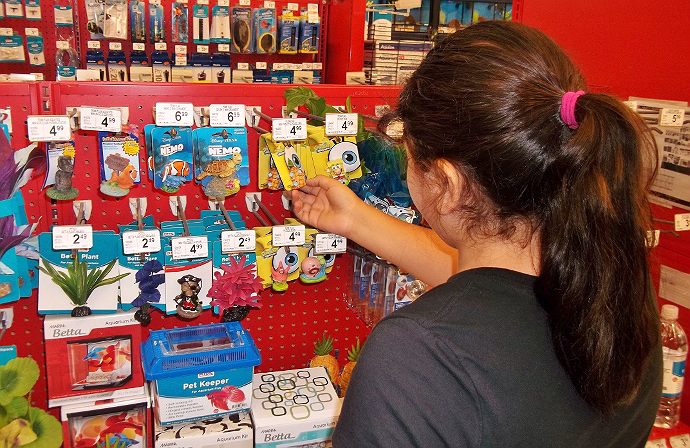 I let Sabrina (10) pick out the Beta she liked best, and it was no surprise she once again proved she had expensive taste, selecting the most flashy (and lively) fish on the Beta display. As it turns out Beta fish love to 'lounge' on plants; creating a sort of hammock from existing leaves and foliage, so we were certain to pick out a few strands of living green to decorate our fish's new home. There are also many types of Beta fish food, specific for the gender, and coloring. Different formulas of fish food will have varied reactions with the scales and coloring of your Beta, so always ask for advice when not sure. These particular fish should be fed once a day, but can also survive up to a week on extended pellets of compressed food. Most importantly, though Betas require the least amount of habitat preparation, they do need chlorine free, filtered water. 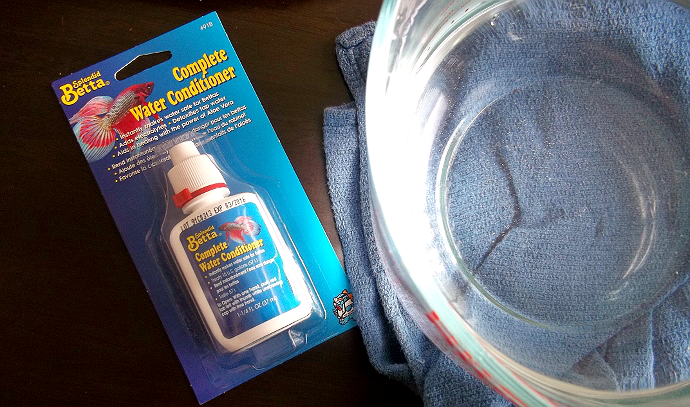 Be sure to invest in some Water Conditioner drops to pre-treat your tank's water, and allow the water and the fish to sit out at room temperature for a few hours before introducing the two in the new habitat. 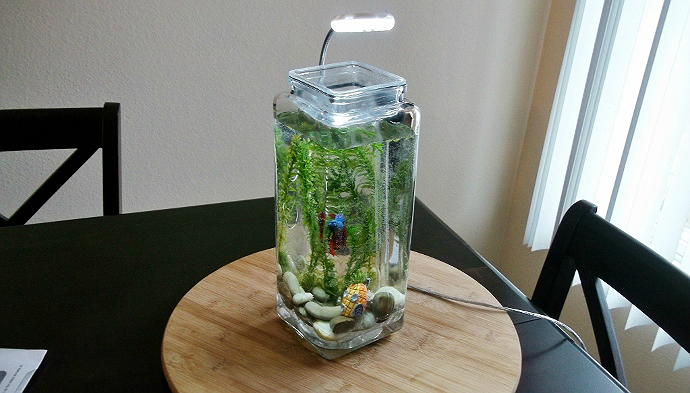 Beta fish should have a natural light cycle; this means your fish tank should be placed where it will receive plenty of natural light (but not in the sun's heat), or outfitted with a simple LED tank light. If you are going the light route, be sure to make sure it is not in danger of being submerged in water, and turn it on and off with your regular sleep and wake cycle each day. Color changing LED lights can be bought at a local pet store to add extra personalization to your tank and decor. While you can decorate your tank as you wish, it's best to keep in mind basic safety flags when choosing decor that is not manufactured specifically for tanks. Avoid painted items that may flake or erode in water, do not over-clutter the tank with items the fish may become caught or snagged in, and always cover the basin of your tank with an even array or rocks (river rocks shown). We wanted to go with a Spongebob theme for our tank, but only the smallest decorations would fit. 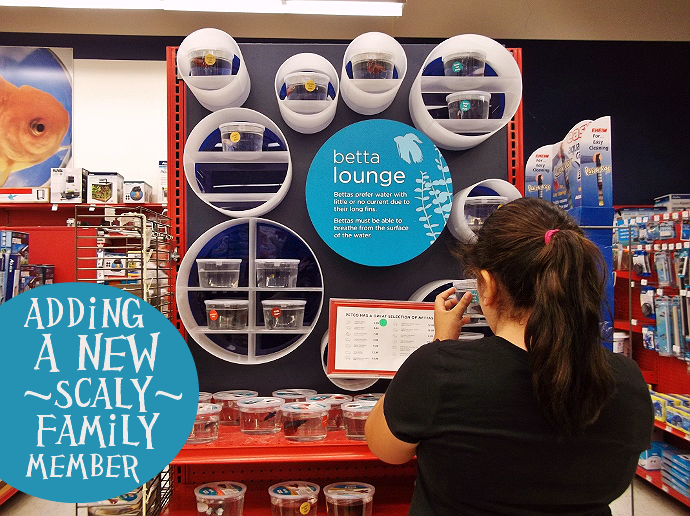 Most Beta tanks are on the efficient (Space saving side), as Betas do not require much room to thrive in. I'm happy to report our newest family member is thriving in his new habitat, this Half Moon Male Beta has beautiful dual-tone colors, and was promptly named 'Gary' (as in the snail) on the ride home from the pet store. We feed him every night (with the furry kids), and clean his tank once a week (by refilling with filtered water). I have to admit, the No Clean Aquarium has really helped make the entire process much easier for me, and I highly recommend looking into it for any family considering a new Beta. (Again, more on the tank and it's unique filtering process in a future post.) I was initially a bit worried about how the cat would take to the fish, but the tank is quite sturdy (thanks to it's tall and skinny structure), and Gary serves more as a beacon of entertainment than a possible late night snack. But Nora (dog) and Truffles (cat) will sit for hours watching him swim back and forth, almost as transfixed as Sabrina. Gary may not be a very hands on type of pet, but he's a welcome part of our family none-the-less. Does your family have a fish? Are you thinking of adopting one? What Daughter Says: Choose the right pets and watch your family grow! We are thinking of getting a pet fish but my main hesitation was the time needed to clean the tank. I will have to look into this self cleaning tank. Thanks for the info! I really loved learning about this self cleaning tank and need to suggest it to my grand daughter for her Beta. I use to always own a 55 gallon aquarium and keep fish and when I get settled I may invest again as I think fish are so relaxing. We had several beta fish. They actually live quite awhile. They are lovely. Very cute. 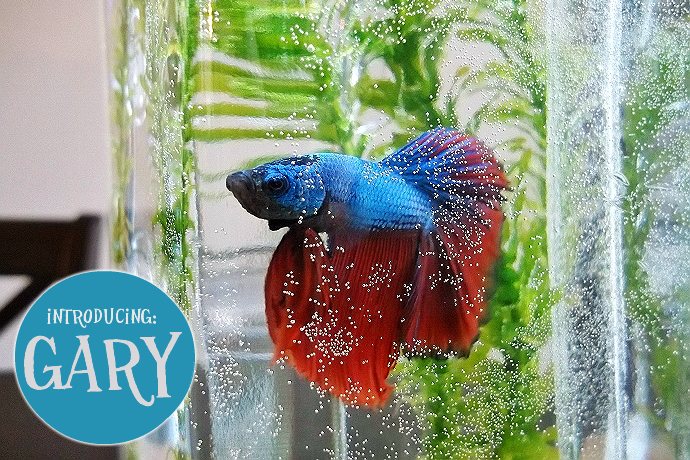 We have a Beta named Swimmy. He is basically mine now. His tank is in the kitchen and he's my little buddy. Betas are a great fish to start with. We had a fish before, and the part I hated the most was cleaning the tank. Seriously I hated it. I would be so much more willing to get a fish again if I had an awesome self cleaning tank like this. Super cite set up you have for your little fish!! I always wanted to have a pet fish but like Teresha, I am not so sure if I can maintain it well. But having a self cleaning tank would be perfect! ...had a hard time taking this article seriously considering you spelled BETTA fish wrong about 26 times. Not to mention the fact that you are keeping a living animal in a jar that's presumably less than a gallon. Bettas are TROPICAL fish. They need at least 2.5 gallons of filtered (this 'self cleaning' tank does not count) and heated water. They naturally live in rice paddies in Thailand which, as you can imagine, are very warm and male Bettas sometimes have up to a mile of territory. So you can see why this sad excuse for a habitat is not at all suitable for Gary or any other living creature. In a tank this size I can assure you he's rotting in ammonia created by his own waste every single day. How fun!! Next time I suggest you do your research before writing an entire article on something you know absolutely nothing about. Good job influencing probably hundreds of moms to also choose this 'easy' and disposable pet for their children.